Illusionists such as Derren Brown often make use of the fact that humans have a particularly bad intuition for some of the most basic mathematical facts. His "head or tails" trick for instance, is based around the concept of so-called non-transitive games, a well-studied topic in mathematics. Another one is the famous "three door problem" (or Monty Hall problem). Apart from their use by illusionists, counterintuitive examples such as these are often also extremely useful for teaching purposes (much more fun than boring examples which just confirm what you already "knew" anyway). In this project you will study some of this counterintuitive mathematics and applications of it to real world problems or real world entertainment. All meetings take place in CM105 unless otherwise indicated. A non-transitive game is a game for which the various strategies produce one or more "loops" of preferences. As a result, in a non-transitive game the fact that strategy A is preferred over strategy B, and strategy B is preferred over strategy C, does not necessarily imply that strategy A is preferred over strategy C. Derren Brown's trick from the video is based on this idea. Have been extended in various ways, e.g. to the realm of quantum games. The Kruskal Count is a card trick invented by Martin J. Kruskal in which a magician "guesses" a card selected by a subject according to a certain counting procedure. With high probability the magician can correctly "guess" the card. The success of the trick is based on a mathematical principle related to coupling methods for Markov chains. See e.g. arXiv:math/0110143. See e.g. p227 of Algebraic Shift Register Sequences by Goresky and Klapper. Use hamming codes to guess a number with lying allowed, see e.g. Hamming Codes. See e.g. the card trick from Edwin Connell's Elements of Abstract and Linear Algebra, page 18. 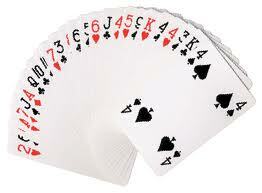 Or The best card trick as described by Michael Kleber. There are many, many variations on this theme, often involving combinatorics and group theory. Any straight-line drawing on a sheet of paper may be folded flat so that, with one straight scissors cut right through the paper, exactly the drawing falls out, and nothing else. Houdini's 1922 book "Paper Magic" includes instructions on how to cut out a 5-point star with one cut. Martin Gardner posed the general question in his Scientific American column in 1960. For the proof, see Chapter 17 of Geometric Folding Algorithms: Linkages, Origami, Polyhedra. The book includes instructions for cutting out a turtle. Has written two books with many examples of non-intuitive maths Impossible? : Surprising Solutions to Counterintuitive Conundrums and Nonplussed! : Mathematical Proof of Implausible Ideas. Many examples are simple but some contain substantial math behind them. Also contains non-statistical examples, e.g. based on graph theory or geometry. Key figure in the field of recreational mathematics, who has written an almost endless supply of articles on surprising mathematics topics, many of which have appeared in Scientific American. There is even a Gathering for Gardner conference dedicated to him.